Rosalie Kunoth-Monks never met James Blue, but she is a member of the pluriverse he loved. Both videos are examples of regional film. Rosalie Kunoth-Monks addressed her remarks to a live audience in Australia. Toni and Candace first deployed their withering lack of respect for logic in a no-budget web series, Thunder Ant, shot in Portland, not far from the house where James Blue grew up. Blue believed that regional film = democratized media = increased diversity of voices being heard. As a member of the NEA’s first media funding panel, he voted to fund a network of regional film centers, all four of which still exist today. One of them is the Northwest Film Center, where The March and A Few Notes On Our Food Problem screened on April 25, 2014 as part of the James Blue Tribute. Blue believed stories could change things. He was fascinated by the exercise of power which came with access to a camera, and never resolved his ambivalence about his privilege as a gifted filmmaker. His awareness of privilege fueled his activism as an educator. It drove him to leave Hollywood. It inspired him to place cameras in the hands of his subjects. He incorporated it into his work. Was James Blue a political filmmaker? In the discussion which followed the screening, Brooke Jacobson, an NEA colleague of James Blue, was startled to hear the audience conclude he was not. Blue shot Who Killed Fourth Ward? on 8mm with a two person crew for community television. By contrast, he shot The March, fourteen years earlier, on 35mm with seven two person Hearst Metrotone newsreel crews and the mandate of the President. The March and A Few Notes On Our Food Problem, made by Blue for USIA and USIAD respectively, deliver a sense of the world as troubled but benign. In Who Killed Fourth Ward? and The Invisible City, made for KUHT community television, that surety is gone. In them, Blue, following a new muse of form, relinquishes his duties as omniscient, unseen narrator, and enters the film as a participant. He is asking questions, and bringing along a camera to make sure he gets answers. It is easy to imagine if the same Northwest Film Center audience had seen those two later documentaries, they would have had no trouble labeling Blue a political filmmaker. 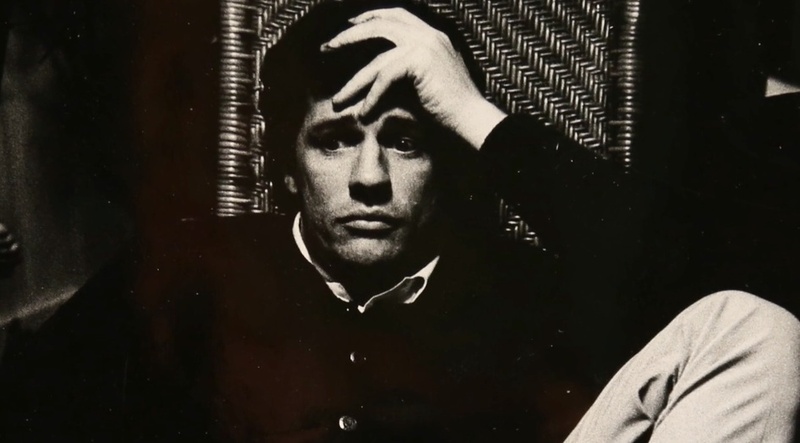 But was Blue, in Houston, a newly political filmmaker? 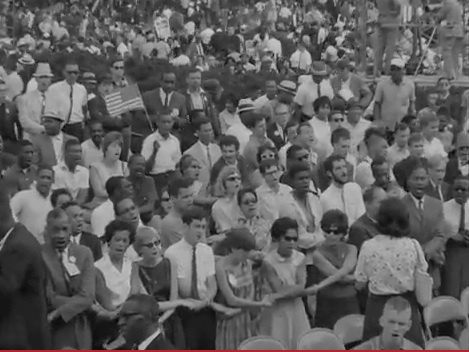 The full title of the March On Washington was March On Washington For Jobs And Freedom. Employment, voting rights, the elimination of Jim Crow – these are not minor demands. The organizers had been preparing for this event for decades. In Blue’s voice over narration, he speaks about the potential for violence, and shows the steps the organizers were taking to keep control of the crowd. Feed people, use walkie talkies, maintain a chain of command. Blue understood what could happen if thousands of citizens squared off against police. He knew what it was like to live in a world where violence had overtaken the civic order. He had directly experienced the war behind the recent Paris Massacre. Disaster, for Blue, was within the realm of the possible. The narrative Blue chose for his coverage of the March focused on the arriving marchers. It focused on the leadership, including young black men, who, at that time, were never seen in media as being calm, purposeful and in charge, but in Blue’s film are shown to be just that. They were entrusted with keeping safe the 200,000 Americans who had arrived to exercise their constitutional right to assembly. Blue leaves out guest speakers Burt Lancaster, Charlton Heston, Bob Dylan and Harry Belafonte and shows us the politically engaged nobodies who came to walk, talk, listen, sing, and cool their feet in the reflecting pool. He photographs them as if they are a miracle, because to him, perhaps, they are. They are the pluriverse he has come to recognize as valuable. The March is about them. For perspective, James Ivory, James Blue’s friend and near exact contemporary, when asked which of his own films he thought was most political, retorted that they all were, or at least he hoped they are all were. I believe James Blue would give the same answer. The March and A Few Notes On Our Food Problem were screened at the Northwest Film Center on April 25, 2014 as part of UO’s James Blue Tribute. Brooke Jacobson, co-founder of the Northwest Film Center, was in the audience. So was Sheldon Renan, the author of the proposal that the NEA fund a network of four regional film centers, of which the Northwest Film Center was one. Sheldon Renan, Brooke Jacobson and James Blue all share two distinctions. They all came from Portland, and each one served as an advocate for regional film at the NEA. Richard Blue, who advised James Blue on A Few Notes On Our Food Problem, and Gill Dennis, who wrote the voiceover narration for A Few Notes, participated in an onstage panel discussion following the screening as did Christina Kovac, who led the NARA restoration of The March, and Gerald O’Grady, a long time Blue colleague and friend, who is an historian of films of the Civil Rights Movement. Notes On James Blue is a blog kept by Anne Richardson, of Oregon Movies, A to Z, to cover the 2014 James Blue Tribute, organized by the University of Oregon. Notes On James Blue is supported by the James Blue Alliance, a 501 c3 non profit organization dedicated to preserving the legacy of filmmaker and film educator James Blue. All thoughts, opinions, and errors, however, belong to Anne Richardson, and do not necessarily reflect those of the Alliance. Are All Oregonians Secretly French?